The other night was one of those breakfast-for-dinner type of nights. Luckily I had this recipe from Joy The Baker in my inbox and decided to try it! I didn't pay much attention to how much batter it was making, but the recipe said it would make two generous servings or four lighter servings, so I decided to double it. Now I have eight waffles in my freezer that were left over - oops! That's it, and it keeps wonderfully in the fridge! These are delicious waffles. Maybe you don't need to double the recipe though! Oh good!! I'm so glad you liked them - of course! Me too!! And, I love pancakes, too :) Sure - hope you like these! oooooo!!! These look so good! And left over waffles can't be such a bad thing right? I love dutch honey syrup...I never knew that's what it was called. Thanks for posting the recipe!! 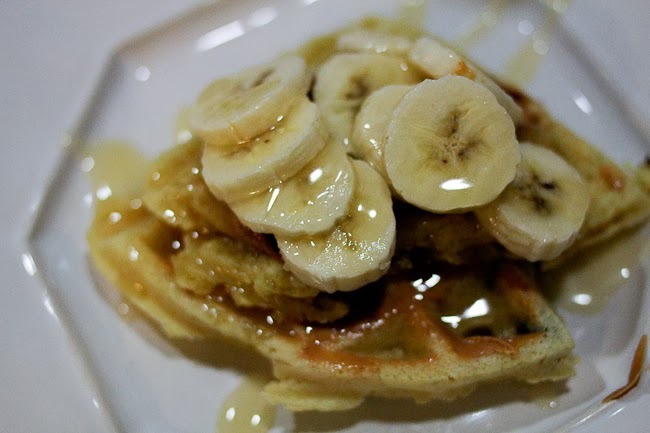 You've got me craving waffles now -- yum!